It's not often you can find everything you want in a high end surf rod at half the price. 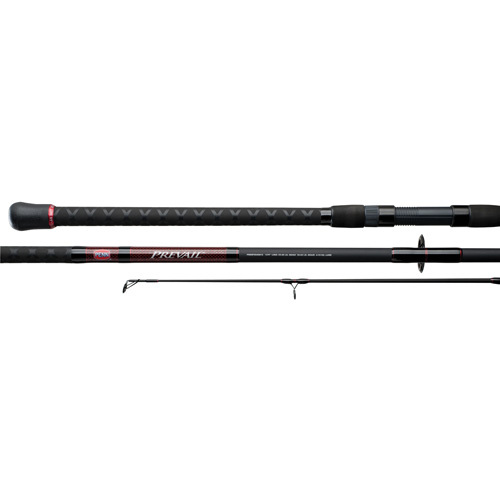 The Prevail provides strength and performance with a two-piece graphite composite rod blank. Stainless steel frames with aluminum oxide inserts create a light weight and durable guide perfect for fishing mono or braid. The rubber shrink tube handle design provides a secure grip whether wet or dry. The Prevail is a perfect match for Penn Sargus, Fierce or Pursuit spinning reels or Squall star drag conventional reels. - Line Weight: 12-20 lbs.